Excellent solution for very low flow. Industrial flow measurement presents many challenges to designers, engineers, operators, and equipment manufacturers, particularly when measuring very low flow rates. Low flow measurement is a critical element of many industrial processes. 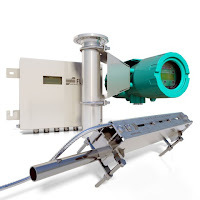 Specific examples of applications with challenging flow measurement are chemical injection for oil & gas exploration and production, odorization lines in natural gas distribution, chemical dosing in water and wastewater treatment, paint spray lines, and myriad applications in pulp & paper industry and chemical and petrochemical industries. Watch the video and read the document below for more detailed information. The product shown here, the Flexus XLF (manufactured by Flexim), provides a stable and long term solution with reliable measurement of extremely low flow rates down to 3 l/h. Additionally, it is non-invasive to the process, highly repeatable, exceptionally rugged, and available for hazardous areas. Non-invasive Flow Meter for Extremely Low Fow Rates from Classic Controls, Inc.